Whether you’re looking for ways to pamper your pooch or just make it easier and more convenient to give your pet the care they deserve, you’ll love these dog subscription boxes! This list represents our favorite subscription boxes for dogs—the ones we’d get for our own pets—including services for pets (and price points) big and small. Find even more dog subscription boxes in our directory and see the dog boxes our readers named their favorites of 2019! Price: $29 a month, or $20 a box with a 12-month subscription. Subscribe here! Why we love it: Each month, you’ll get a box of quirky toys, treats, and grooming products specially picked for your dog’s size. Not only are the products high-quality—they’re also so charming! We got a heartwarming soup-pot-shaped toy in the “Winter Walkies” box, a super-cute sloth toy in the “Secrets of the Rainfurrest” box, and a plush in the shape of a retro instant camera for the “Who’s Coming to Prom?” box! Check out our BarkBox Reviews for more information on subscribing to BarkBox. Ships to US and Canada. Price: Plans start at $19.99. Subscribe here! Why we love it: Pooch Perks features toys and USA-sourced, primarily grain-free treats. Each box is customized to your dog’s size and food allergies, and you can even opt to receive an extra toy! Pooch Perks also offers customizable gifting options if you’d like to nab a treat for another dog in your life! Find out more about Pooch Perks here. Ships to US. Price: Plans start at$29.99 a month + free US shipping. Subscribe here! Coupon: Use code DAPPERADDICTION save 10% off your first box! Why we love it: Each Dapper Dog Box includes adorable toys, treats, and a bandana! The colors and cute, quirky designs make this subscription a favorite of ours. Plus, Dapper Dog Box contributes to organizations that support shelter dogs around the country! Check out our Dapper Dog Box Reviews for more information on subscribing to Dapper Dog. Ships worldwide. 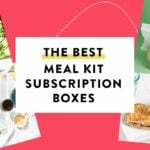 Price: $39 a month + free shipping, $34 a month + free shipping with a 6-month subscription, or $29 a month + free shipping with a 12-month subscription. Sign up here! Why we love it: These toys and treats are made just for pups who love to chew! Each box comes with two durable rubber or nylon toys, two bags of treats, and two chews. Check out our Super Chewer Reviews for more information on subscribing to the Super Chewer Box. Ships to US and Canada. Price: $24.99 a month on a month-to-month plan, with better deals for longer subscriptions. Subscribe here! Coupon: Use coupon code FREE-PT BED to get a free dog bed with the first month of the Pet Treater Dog Box. Why we love it: Pet Treater boxes include a collection of American-made treats, toys, and helpful items like leashes, poop bags, grooming supplies, and more. It’s a fun option for exploring new brands to keep your pet busy! Check out our Pet Treater Reviews for more information on subscribing to Pet Treater. Ships to US only. Tennessee residents pay 9.5% sales tax. Price: $29.95 a month for the bronze level (3-5 items for one type of pet); $39.95 a month for the silver level (6-8 items for up to two types of pet); $49.95 a month for the gold level (9+ items for three types of pets); save with longer subscriptions. Subscribe here! Why we love it: Cuddle Crate lets you customize the size, delivery options, and payment plan that fits you and your pet’s needs. In each box, you’ll get grain-free, American-made treats, toys, and supplies. It makes a great gift, too! Check out our Cuddle Crate Reviews for more information on subscribing to Cuddle Crate. Ships to US only. Price: Plans start at $29.00 per month. Subscribe here! Coupon: Use code MSABONUS for free bonus goodies with your first order (2 extra items with any Uno Box plan, 3 extra on Grande or Power Chewer plans). Why we love it: Valued at over twice its cost, each PupJoy box provides dog toys, treats, and accessories from top indie brands. Plus every purchase helps shelter animals in need! Check out our PupJoy Reviews for more information on subscribing to PupJoy. Ships to US (free) and Canada. Price: $35.00 per month. Subscribe here! Why we love it: Paw Pack sends you and your dog a monthly box of eco-friendly, organic, and grain-free treats, fun toys, accessories, and more! You’ll get both full- and sample-sized treats to try, all with Paw Pack’s 100% allergy guarantee. The company also donates to support rescue animals! Check out our Paw Pack Reviews for more information. Ships to US. Price: $30.00 per month. Subscribe here! Coupon: Use code ADDICTION for 10% off your first month. Why we love it: This family-owned subscription sends members high-quality toys, ingredient-conscious treats, and a personal note from the owners to you and your pup. They even let subscribers choose the charities Surprise My Pet supports! Check out our Surprise My Pet Reviews for more information on subscribing to Surprise My Pet. Ships worldwide. Price: $34.00 per month or save with longer subscriptions. Subscribe here! Why we love it: These toys and treats are hand-selected power chewers, meaning they’ll be well-suited to your dog’s unique preferences and health needs. And all of the products in each Bullymake Box are US-made! Check out Bullymake Reviews for more information on subscribing to Bullymake. Ships to US for free, Canada for $8. Price: $26.00 per month. Subscribe here! Why we love it: PupBox aims to make puppyhood easier. Each box contains 5-7 full-sized products (treats, toys, chews, accessories) that are customized for the age and size of your pup. Additionally, PupBox offers a training and development guide to help you stay on-task with training your puppy. Check out PupBox Reviews for more information on subscribing to PupBox. Ships to US only. Price: $43.00 per month. Prices vary by dog size. Subscribe here! Why we love it: VetPetBox was created by veterinarians, meaning each box is curated with your pet’s unique health needs in mind. You’ll receive treats, toys, a veterinary-grade wellness product, and educational materials to help you keep your pet happy and healthy. Check out VetPetBox Reviews for more information on subscribing to VetPetBox. Ships to US and Canada. Price: $12.99 per month + free shipping. Subscribe here! Why we love it: This affordable subscription is a great pick for discovering new brands of toys and treats! Each Mini Mystery Box contains at LEAST 1 bag of American- or Canadian- made treats and one toy, PLUS access to secret member deals and add-ons. Check out our Mini Mystery Box for Dogs reviews for more information on subscribing. Ships to US only. Check out our full list of subscription boxes for dogs here—you can also explore subscription boxes for cats and more!